My name is Ted, and I’m 13 years old. I would like to thank my mum Susan – she’s always helped me. When I was two, I was diagnosed with a very rare metabolic disorder called M.C.A.D.D. Only 1 in 10,000 children have it and I was very lucky I was diagnosed, because M.C.A.D.D can be life threatening. My childhood was very difficult because I was in hospital a lot due to my M.C.A.D.D. I missed lots of school, which set me back academically. I also have dyslexia, which wasn’t acknowledged by my primary school teachers who called me lazy. This is also when the bullying began. By the end of Year 5, my emotional wellbeing was at an all-time low and I suffered in silence. My mother realised my lack of friends was making me very depressed. I was referred me to a psychotherapist at Great Ormond Street Hospital. The sessions I had with her were very helpful and my mood improved. Mum had to push the GP to make the referral happen and didn’t take no for an answer. 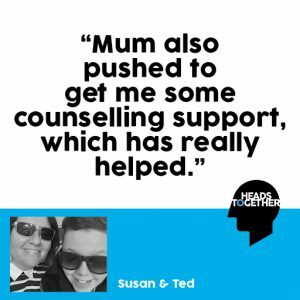 Mum also pushed to get me some counselling support, which has really helped. I go to a local counsellor once a week, but we pay for it, since it’s not funded. Now I’m in Year 9 I feel better able to cope with any bullying and the support at school is much better. My M.C.A.D.D will always be a problem, and I do still miss a lot of school, but I’m lucky to have good friends who help me catch up, and of course my mum who is always there for me when I need it. If you need some support, our charity partners are there for you. Young Minds have support services for children and young people find out more here.